Example: Look up Thaumium Cap recipe, close the interface, then look up any vanilla item (Diamond chestplate, for example). Clicking through the arrows along the top will eventually bring up the Thaumium Cap recipe again, even though you're SUPPOSED to be looking up Diamond Chestplate recipes. 2: "Crusable crafting" is supposed to be "Crucible"
Hi there! I'm just letting you know that I will be using this mod in my custom modpack! Thanks! As long as it is a curse pack go ahead. Do you have a bugtracker for this? We have a few people reporting issues with a recipe "sticking" when looking it up, and apparently downgrading the mod from 1.3.0 to 1.2.3 fixes the issue for them. I saw you have several github repos, but not for this mod. 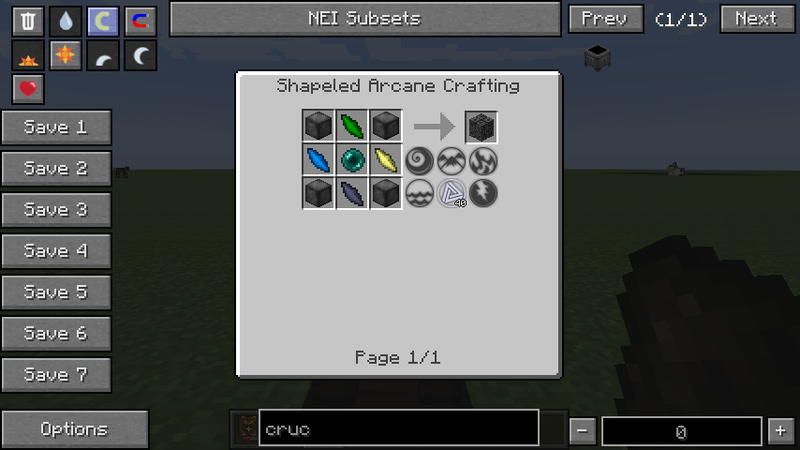 how your mod is different than http://minecraft.curseforge.com/mc-mods/225095-thaumcraft-nei-plugin/files ? It is not, I did not know there was a different one. Though I do see you point.